On May 28 2015 we conducted one more webinar as part of our Thursday Webinar Series for Asia Pacific. This blog post is a recap of the webinar. You will be able to check out the slide deck that i used in the webinar and also the video recording of the webinar if you missed it live. This webinar was all about understanding how to create Word/Excel/PDF documents without installing either MS Office software of any PDF related software on your web server. 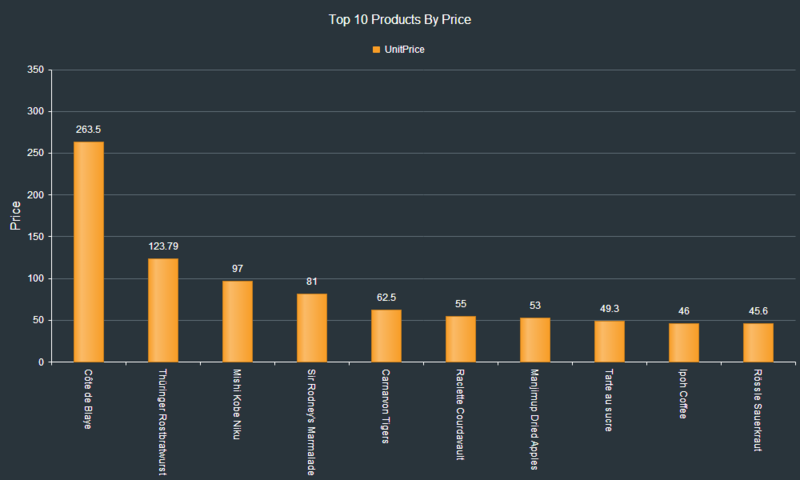 Rather use our UI for ASP.NET AJAX suite and perform the document processing task. 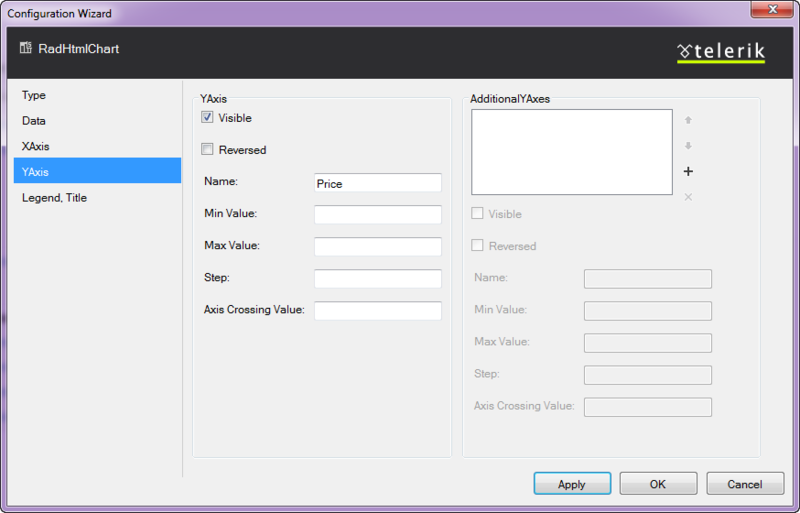 UI for ASP.NET AJAX is our complete toolbox for your ASP.NET AJAX based web applications. You get 70+ controls in this suite. The controls cater to almost any needs of your project. 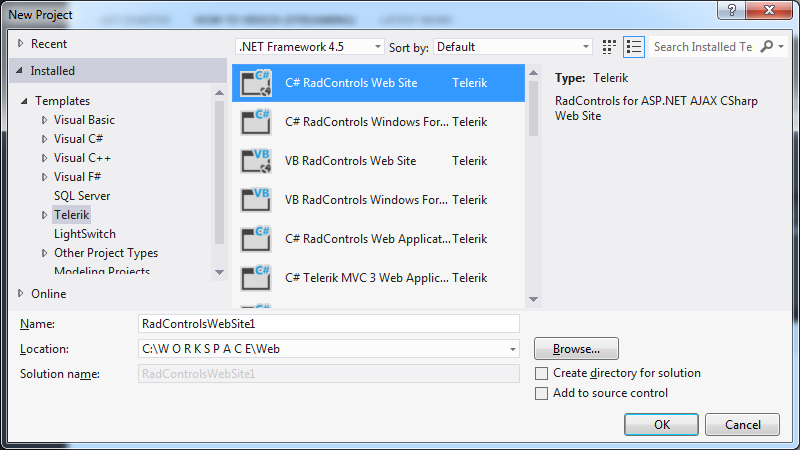 You can know more about our ASP.NET AJAX controls suite here: http://www.telerik.com/aspnet-ajax. Here is the video recording of the webinar. If you missed live webinar, you now have on demand viewing through the below recording. 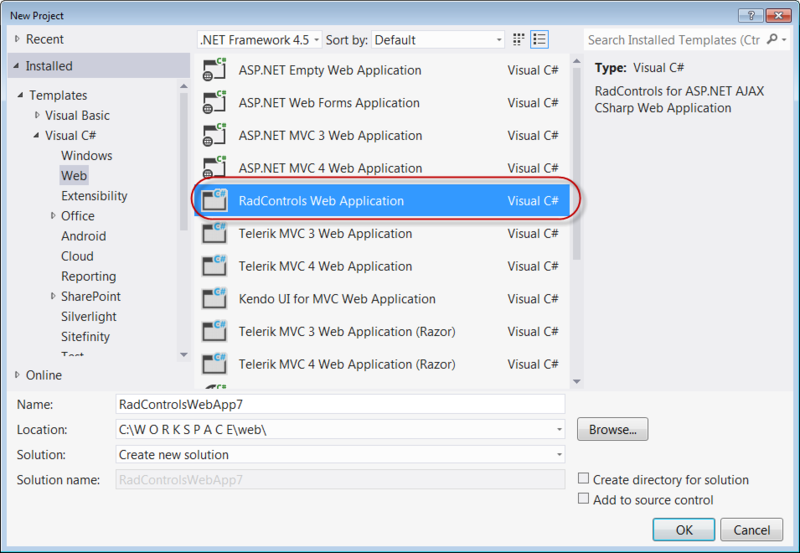 On Jul 12 2014, we conducted a webinar titled “Integrate Video and Photos in your ASP.NET applications with ease”. 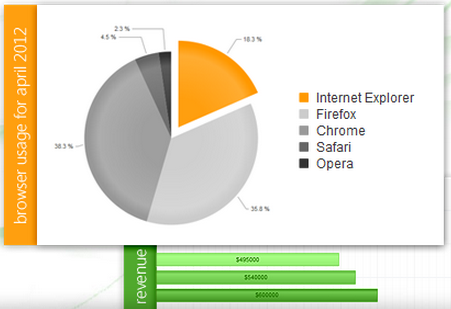 This is part of the monthly webinars we have been doing here in Telerik India. This blog post is a recap of that webinar. As the name goes, RadImageGallery can be used to create Image Gallery in your apps with minimal coding. Similarly, RadMediaPlayer can be used to create a YouTube like Media Player with minimal coding. 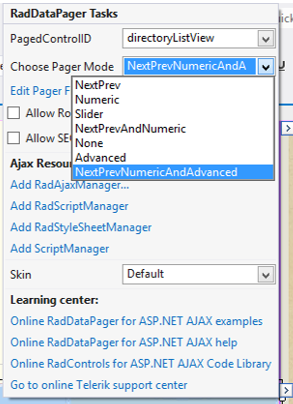 Both of these controls are part of our “UI for ASP.NET AJAX” suite. 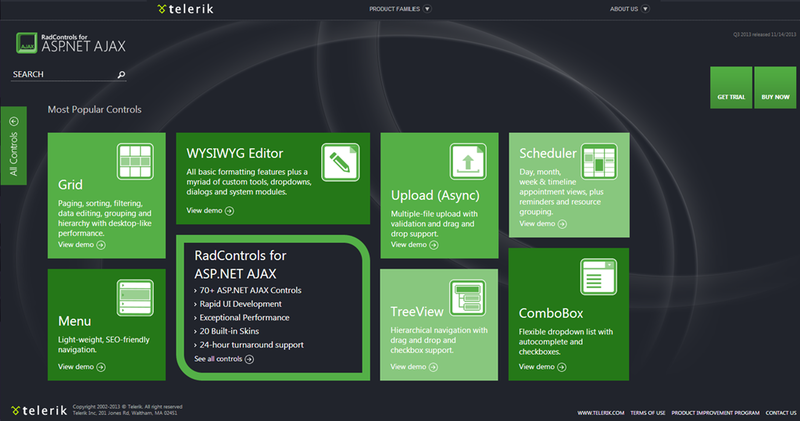 If you are not familiar with our “UI for ASP.NET AJAX” suite of controls, head over to our product overview page here. You can know more about RadImageGallery here and about RadMediaPlayer here. Q: Is the library of these controls free to download or require any license? Q: Does it take Images from online services/providers like Flicker/OneDrive and stream here in control? 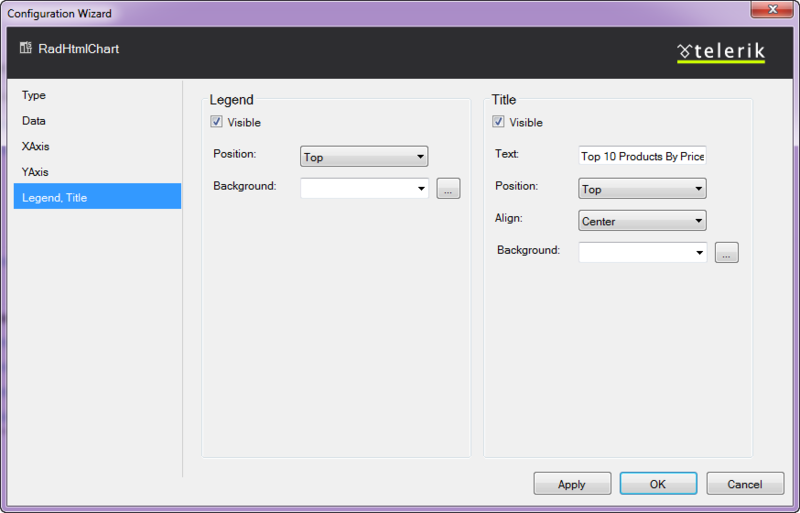 A: Both of these controls provide a feature of binding data from the client side. 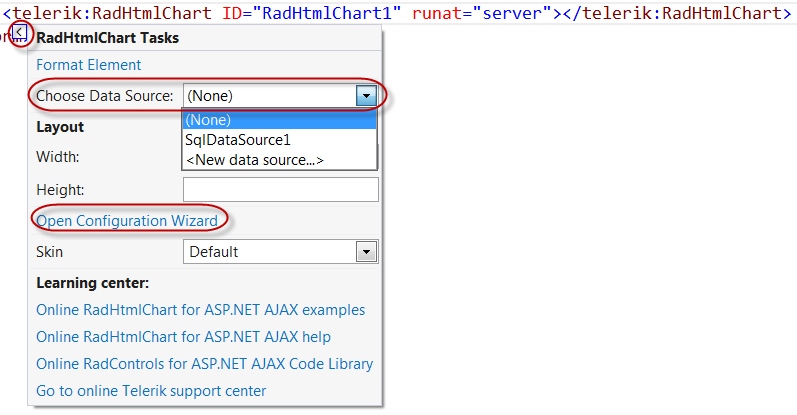 So you can get the data as JSON on page load and bind it to the control client side. Q: Can we have this Image Gallery in MVC? A: No. 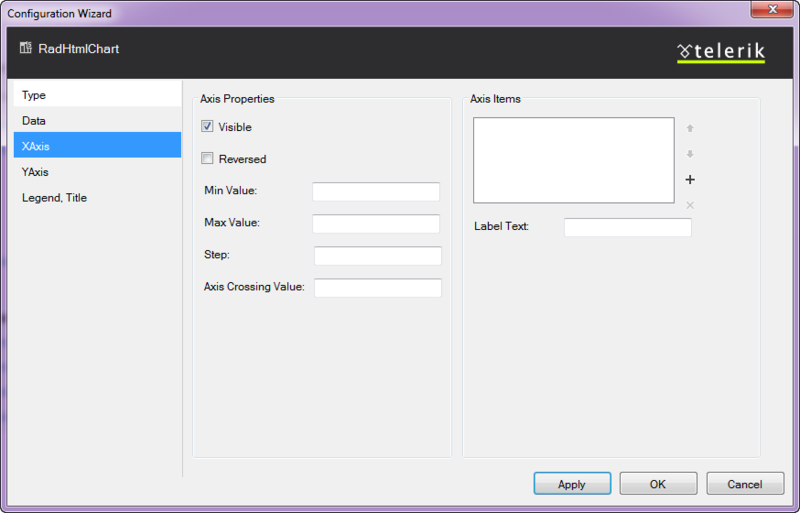 This is a ASP.NET AJAX control. 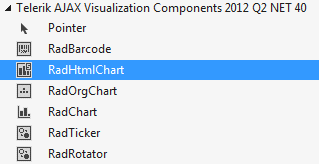 Cannot be used in MVC. Q: does RadImageGallery provides paging? Q: Can we specify how many thumbnails to show/ or customize thumbnail settings? A: RadImageGallery provides a thumbnails settings where we can set Width, Height, Thumbnail Width, Thumbnail Height and Thumbnail spacing. 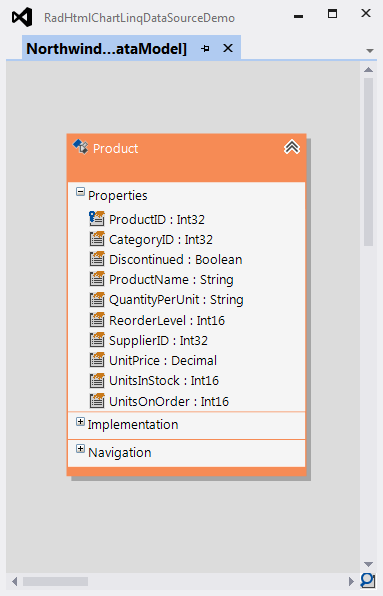 Q: How to get and integrate these controls to Visual studio? 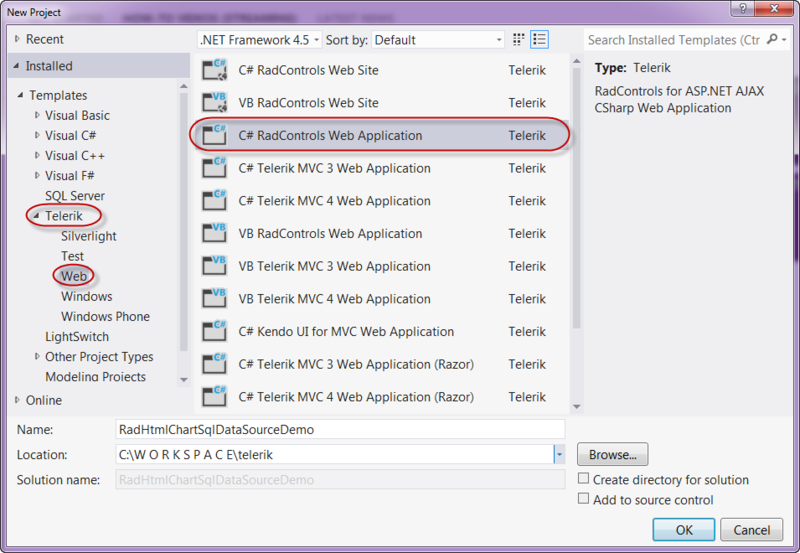 A: Download the controls from http://www.telerik.com/products/aspnet-ajax.aspx. 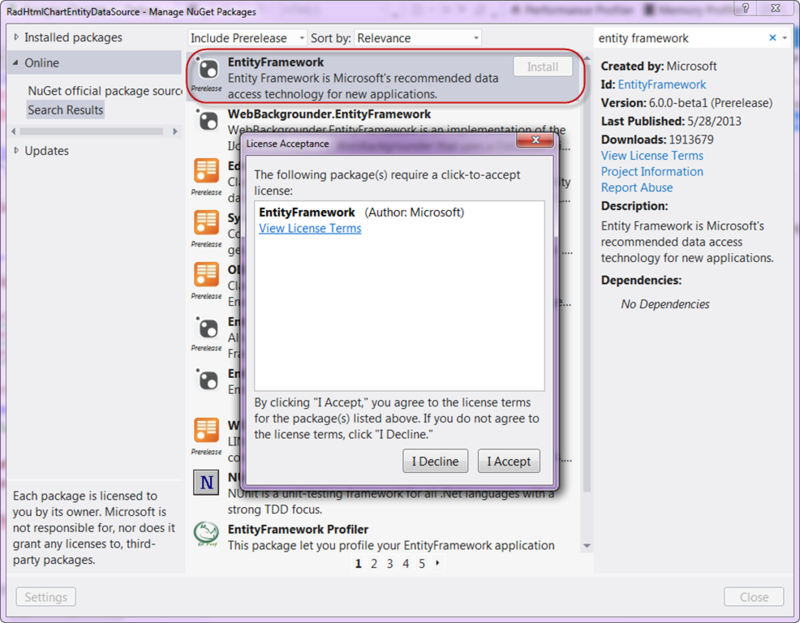 Run the Installer and that will integrate the controls in the control toolbox. Go ahead from there. Q: Can we incrase the size of the preview display and keep the thumbnails in different dimensions? A: Yes. RadImageGallery provide Image Area Settings and Thumbnails Area Settings. Q: Can we give the source dynamically to the rad media player? A: Yes. The data can be bound to RadMediaPlayer through code also. Q: Does it require any media player to be installed at client side like Silverlight/Adobe media player? A: No. RadMediaPlayer uses the build-in HTML5 <video> and <audio> element functionality to bring powerful media capabilities to your apps without the necessity of installing additional plug-ins. It provides a quick and easy to setup way to deliver rich media web experience for websites, blogs, online TV channels, e-commerce pages, etc. For older browsers which don’t support HTML5 natively, Internet Explorer 8 and 7 in particular, the player provides a Flash fallback method to play the video or audio file by rendering a Flash object. Q: Does the image gallery support mobile platforms? How does it perform? 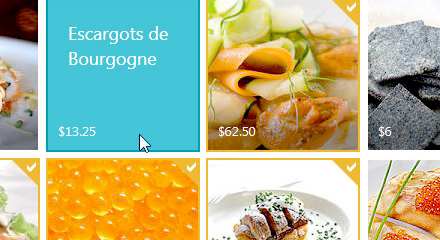 Q: Does this control work on IE 6? Don’t worry if you didn’t win the t-shirt. Try your luck in our next webinar. Recently when talking to one of our clients, I had a question from them. They said your demos are great and covers most of the scenarios but when I take a particular control lets say Grid, how do I get started. Well that question prompted me to write this blog post. So if you are one of those who get the exact question in your mind about our controls, then do read on. Online Help or you can download a copy of CHM format, MS Help 2 format or MS Help 3 format. Clicking on “Online Help” will give you the documentation online. Where as other options you can download the help documentation on to your hard disks. For this blog post I will consider the “Online Help” option and point you to resources there. This will be the same for other formats too. If you notice the help documentation page, we have a tree on the left hand side. This tree lists down a lot options for you to get help on. 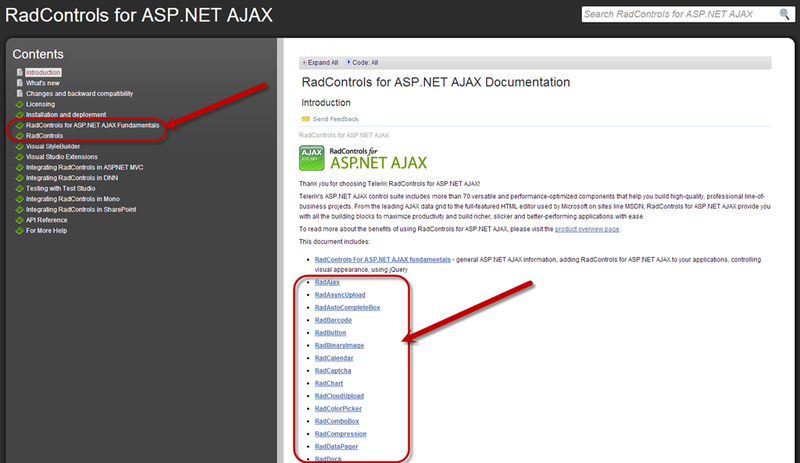 I have highlighted 2 sections, namely – RadControls for ASP.NET AJAX Fundamentals and RadControls. 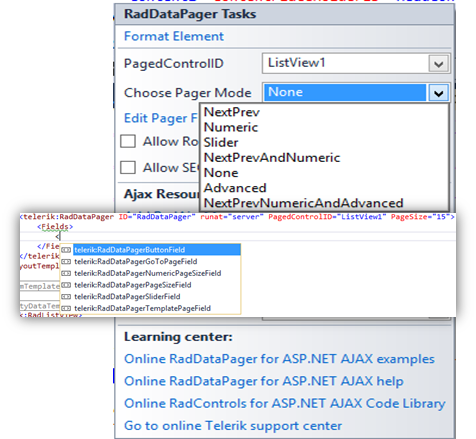 The RadControls for ASP.NET AJAX Fundamentals will give you fundamental details about ASP.NET AJAX and about the RadControls itself. If you want to get to the documentation of controls you will need to expand the section “RadControls” which then will list all of our controls. As a shortcut, on the center section of the online help page, you will see links to controls directly and you can click on your control of interest. You will be navigated to that controls Documentation now. Now that you know how to navigate to the Help Documentation, the next step is to figure out getting started with a control. Remember the short cut I said that is available on the help documentation home page – well find the control you want to learn and click on it (the control name is a hyperlink which will take you to its documentation). 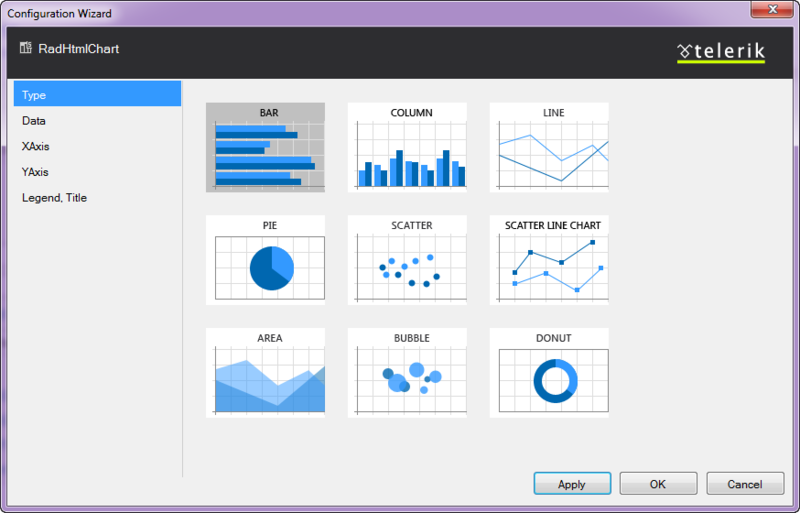 For this exercise I will take our most popular control Grid and walk you through. 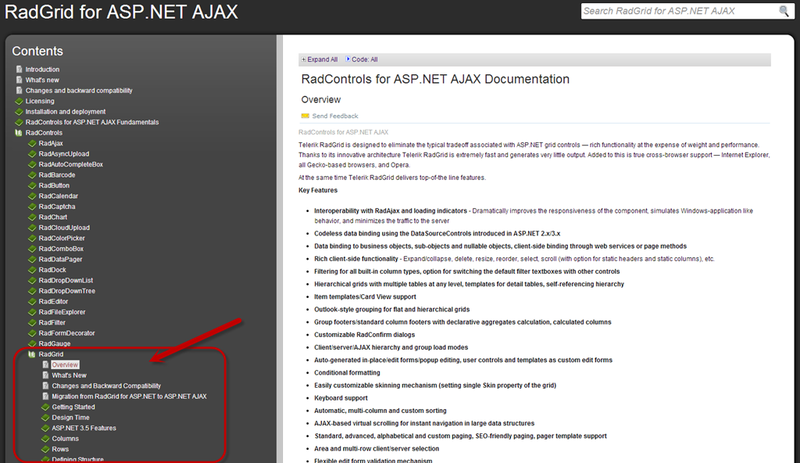 Once I click on the RadGrid hyperlink, it will take me to RadGrid for ASP.NET AJAX Overview page. The left side tree on the page will now have the node RadGrid under RadControls be default selected and the sub nodes under it would have been expanded. Now you will see a sub node called Getting Started. Click on it to expand the node. 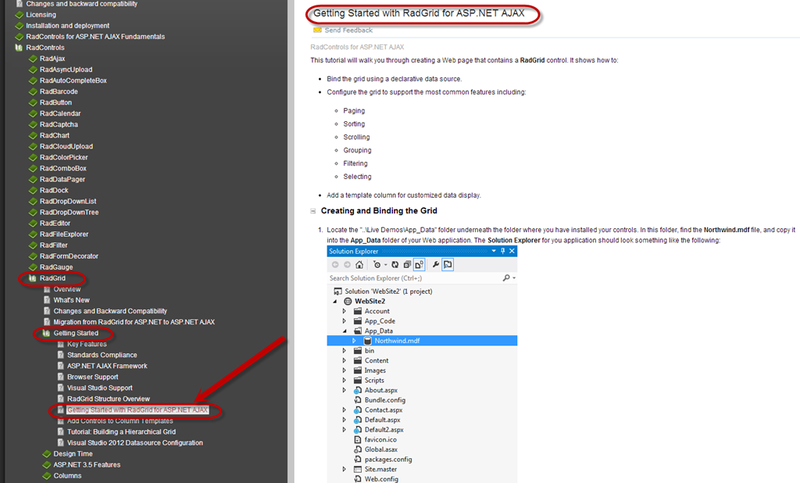 You will now see a child node which says “Getting Started with RadGrid for ASP.NET AJAX”. 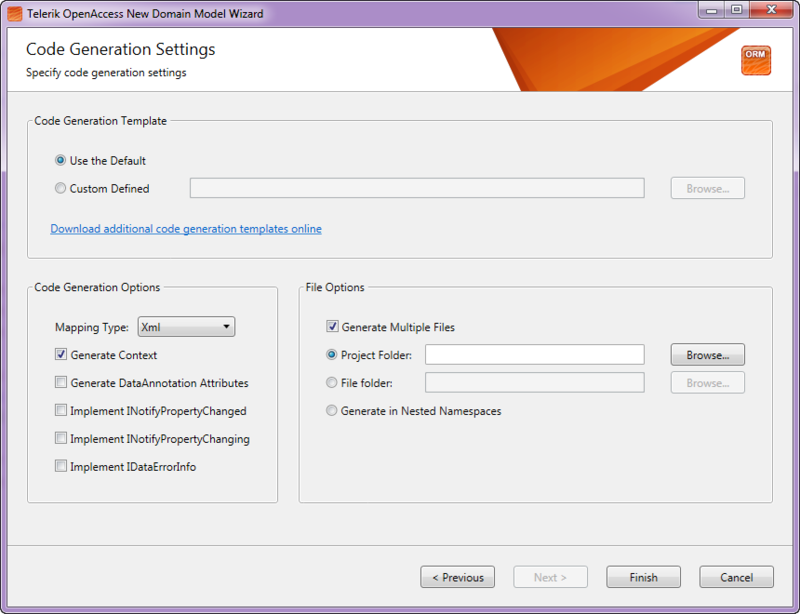 Click on the link and you will get a step by step guide on how to start working with our Grid. And that’s it – now you can first go through the getting started, understand steps required to get a Grid on your page and start using the grid. 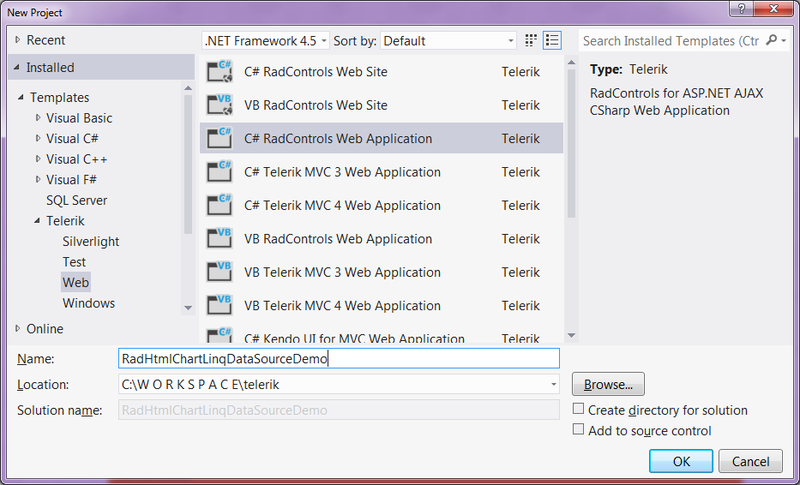 Now that you know how to get started with the Telerik RadGrid, next step would be to start looking at our demos to understand different features and how to work with those features. In our demos we try to provide you with all the scenarios in which a Grid will be used in real world applications. 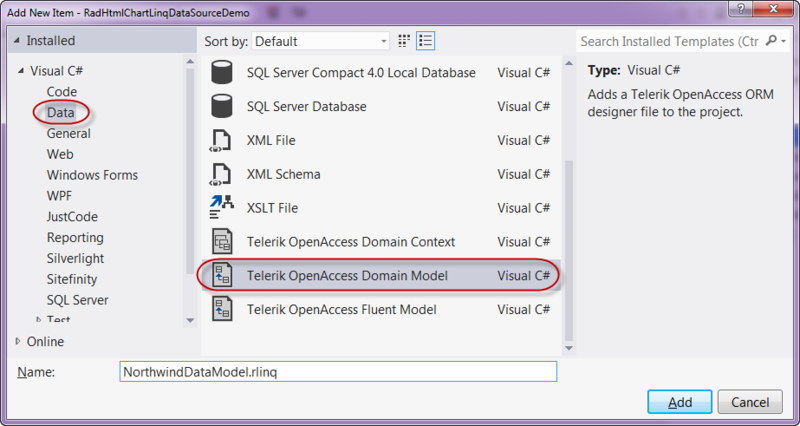 So take a look at the demos online here – http://demos.telerik.com/aspnet-ajax/. Note that, when you download our product, the same online demo is shipped and installed on your hard disk. So you can just open the local demos right from your hard disk and go through them. Whenever you are starting new, without knowing the right resources and guide its little tough to get started. Idea of this blog post was to hold your hand and walk you through various resources we here at Telerik have to make your experience of developing with Telerik controls an easy one. Personally as a developer at heart first place I go to is our documentation to understand the control and to go over its API exposed. Next stop would be Telerik TV and finally a look at the demos to understand different features and scenario in which the control can be used. 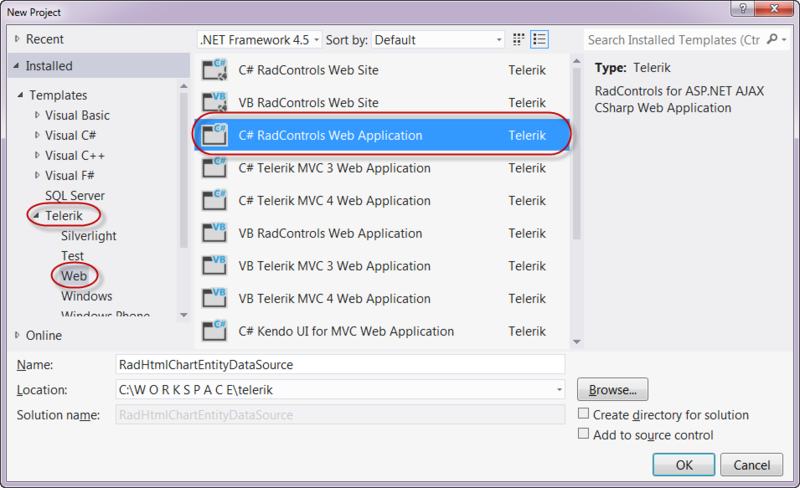 Hope these simple steps will help you all with your evaluation of Telerik controls and make it much more easier and simpler to evaluate. Do feel free to get in touch with us in case you need further assistance. 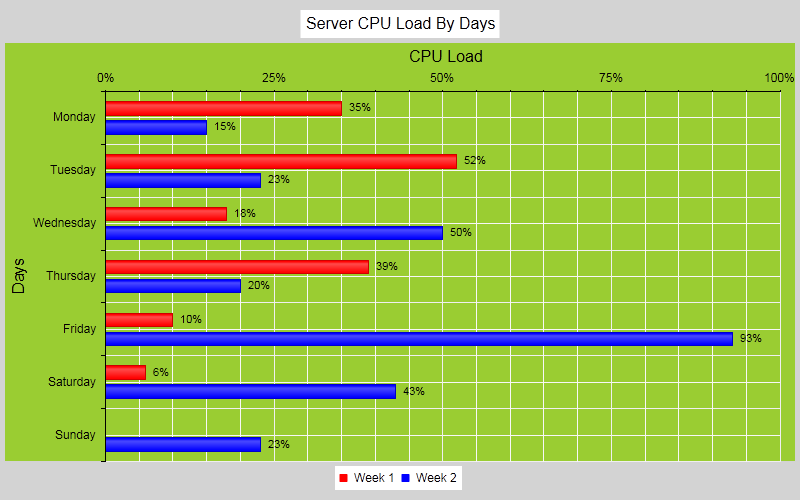 Now, we would represent the same data through the help of RadScheduler. 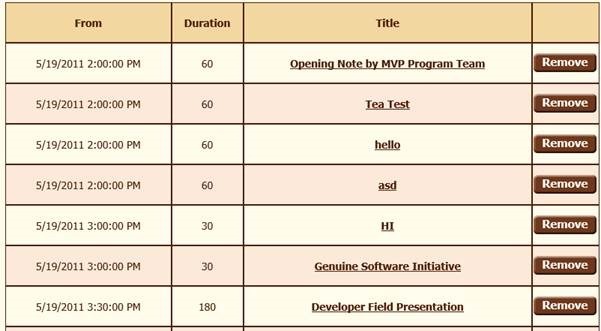 The reason we have chosen Scheduler is because all the registered session/appointments would be visible in a calendar format. 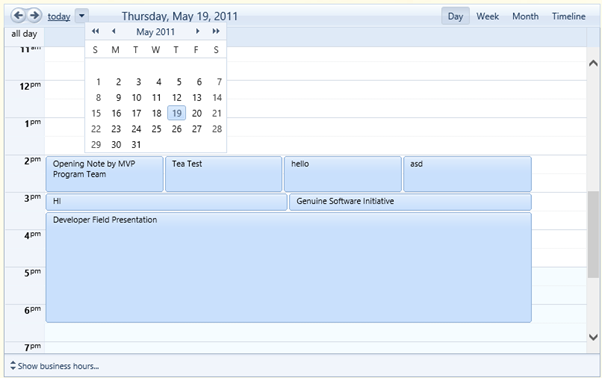 The timeline of this calendar, along with date view also provides the time view which provides a perfect solution for an end-user. 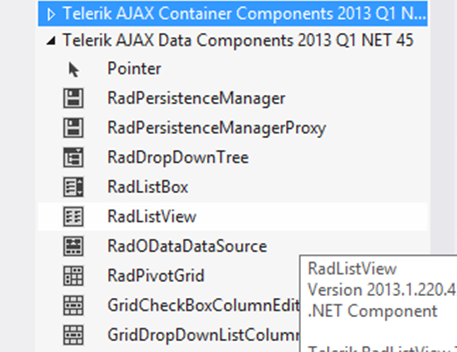 Under Telerik AJAX Calendar and Scheduler Components (me using the 2013 Q1 for Net 45) select RadScheduler. 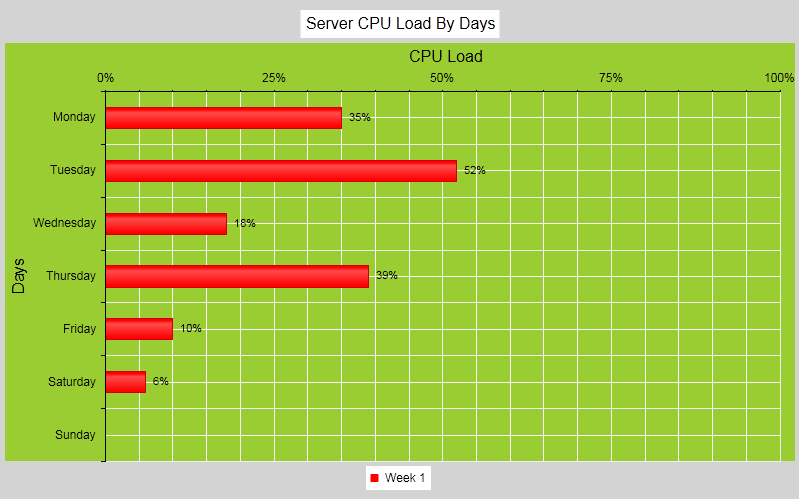 This creates a context for the data from our DAL (Data Access Layer). 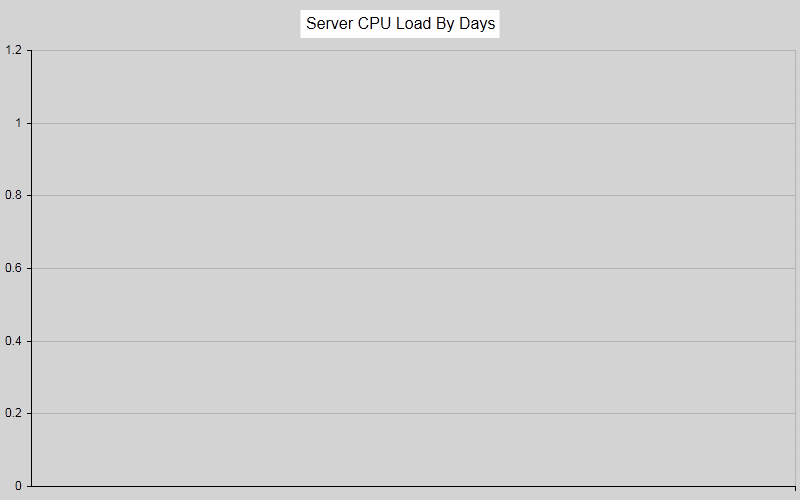 Attach datasource to the RadScheduler first time the page is loaded. And your application is ready to run. 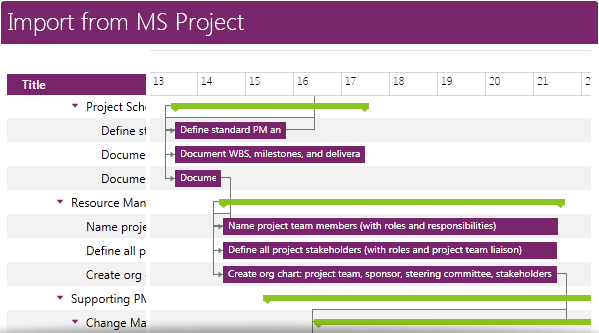 SECTION 1: We need an appropriate data to be represented in a Scheduler view. 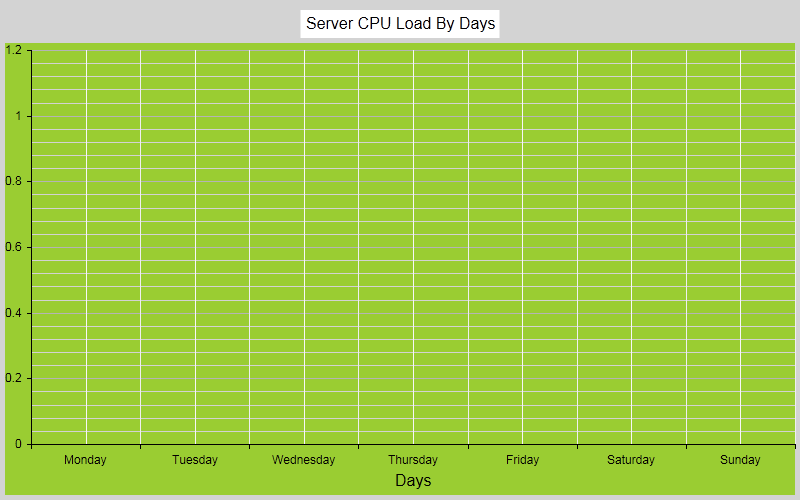 Hence, we have created a data source namely sessiontime. We plan to represent the user specified session. 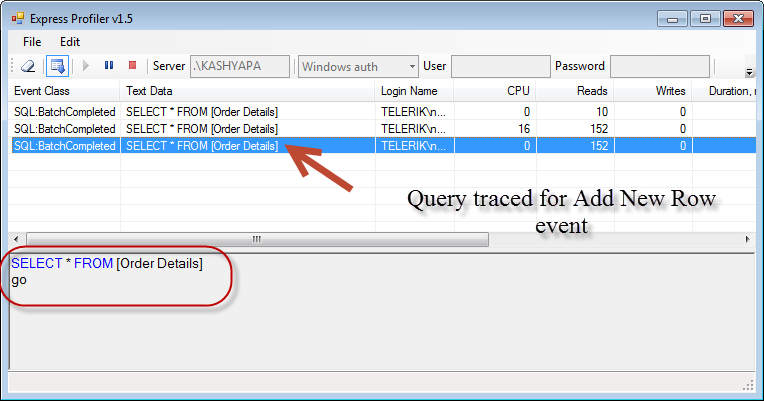 To do so, the join query is used to create a new view which includes the very important timing details, session title and session key. SECTION 2: Detail of the current user is necessary because the cart functionality is specific to self. 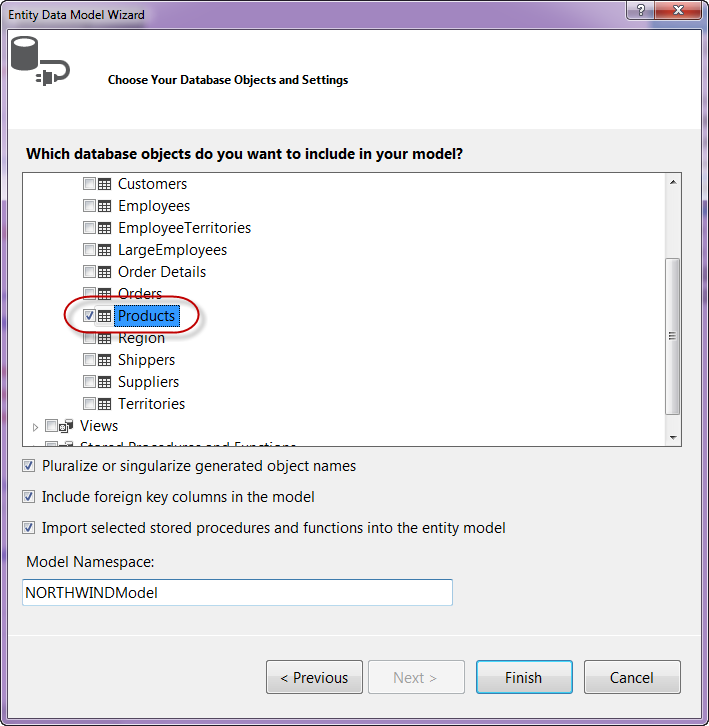 SECTION 3: For RadScheduler to work we need to specify its DataKeyField, DataStartField, DataEndField, DataSubjectField and DataSource. 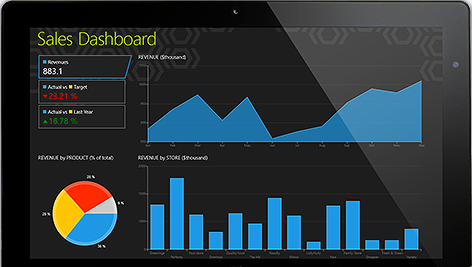 DataSource property is where we attach the data to the control. DataSourceID Overridden. 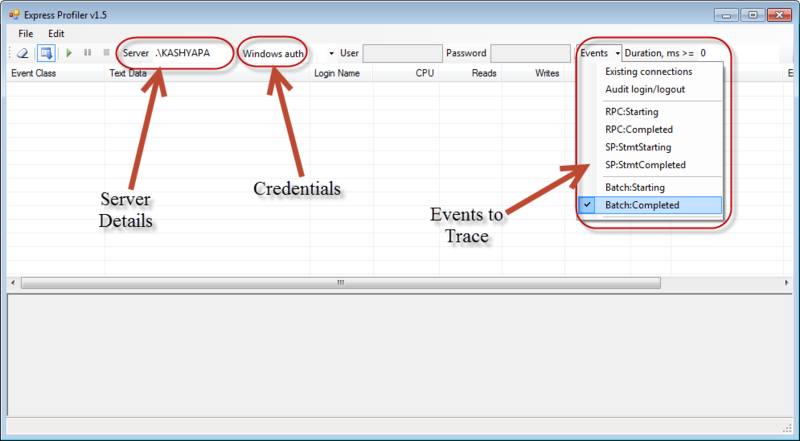 Gets or sets the ID property of the data source control that the RadScheduler should use to retrieve its data source. DataKeyField Gets or sets the key field for appointments in the data source specified by the DataSourceID property. 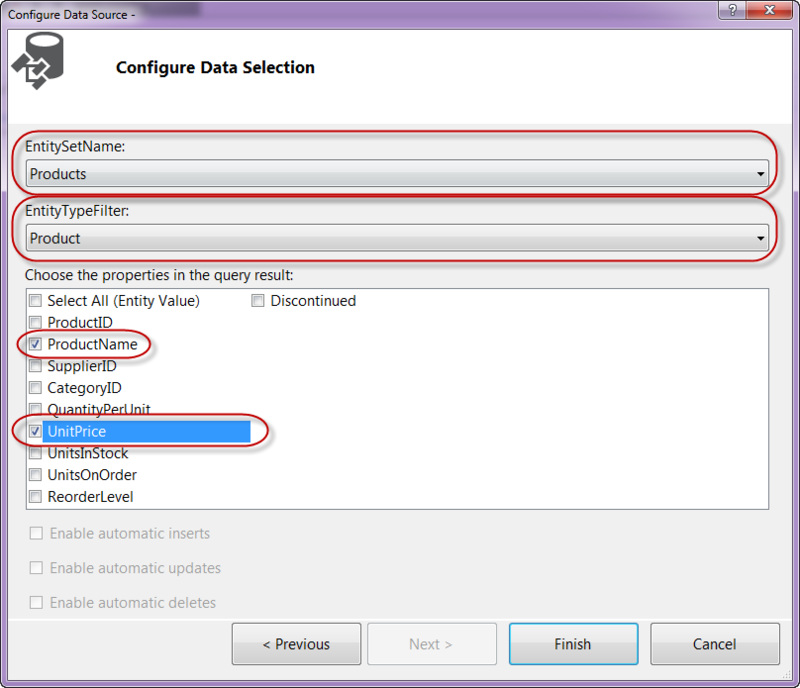 DataStartField Gets or sets the start field for appointments in the data source specified by the DataSourceID property. 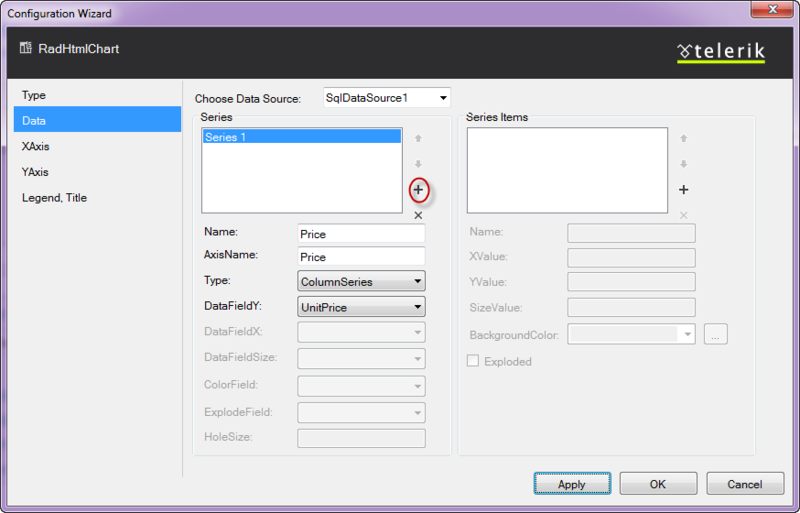 DataEndField Gets or sets the end field for appointments in the data source specified by the DataSourceID property. DataSubjectField Gets or sets the subject field for appointments in the data source specified by the DataSourceID property. 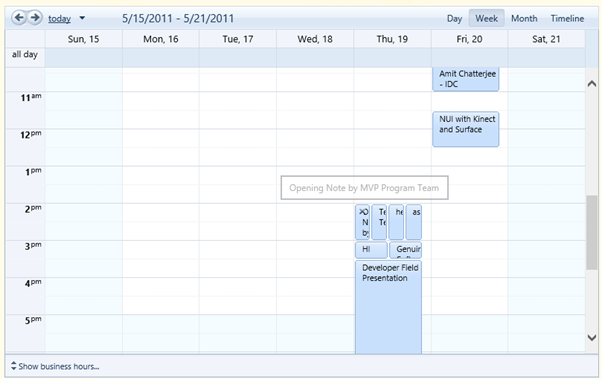 Next, we tweak/explore some more features to improve our Scheduler. We don’t want our users to end up on a random date. SECTION 4: We have set the date to the date when the first event takes place. SECTION 5: We finally bind the data to the control. 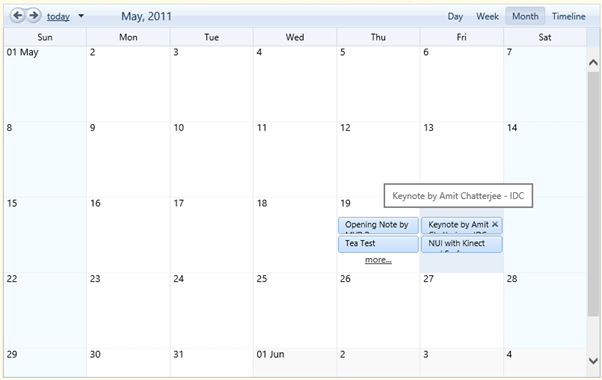 Let us now add a click event to the session, such that the page is redirected to the session details once clicked. Also, let us define what happens when a person clicks the cross symbol on the appointment. 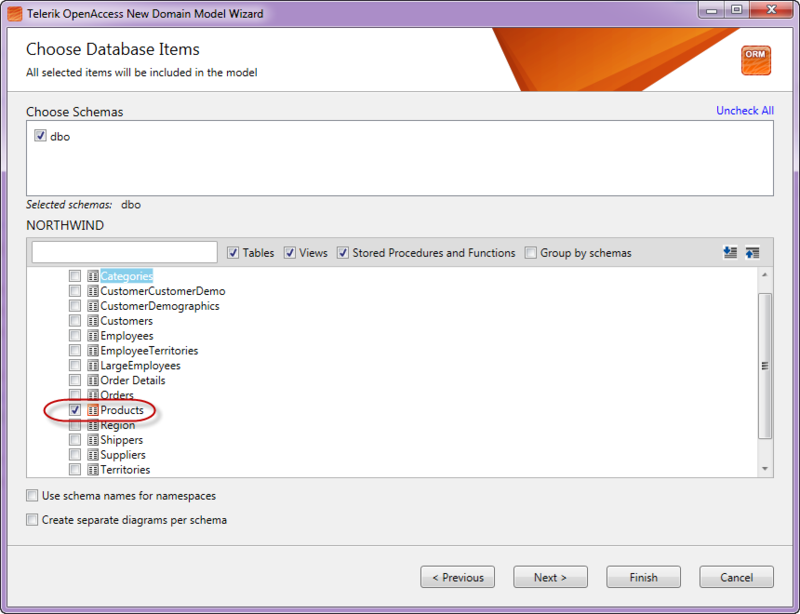 SECTION 1: To delete the item from the table we first need to extract that row from the context. 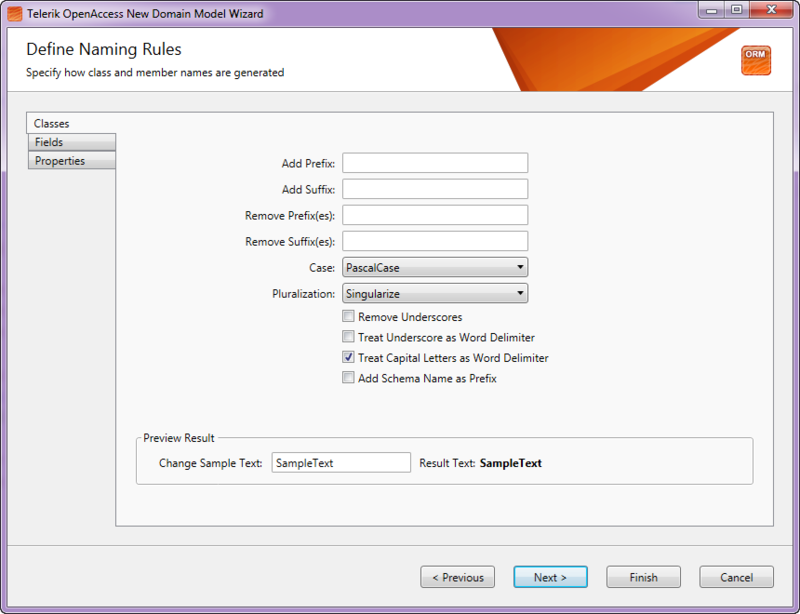 Once we have extracted the row we can easily remove the data using the CRUD Operations of OpenAccess ORM. 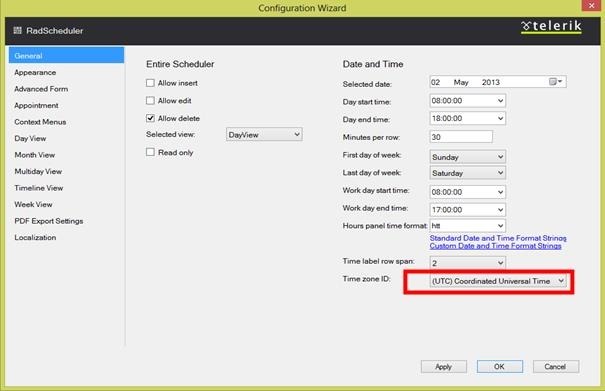 “e.Appointment.ID” is used to abstract the DataKeyField of the RadScheduler. SECTION 2: Once the data is removed we need to rebind the data. To rebind the data, we need to refresh the data source. Hence, we create a data source and bind the control. Until now we talked about how we can do things programmatically. Let us now focus on the wizard of the control. 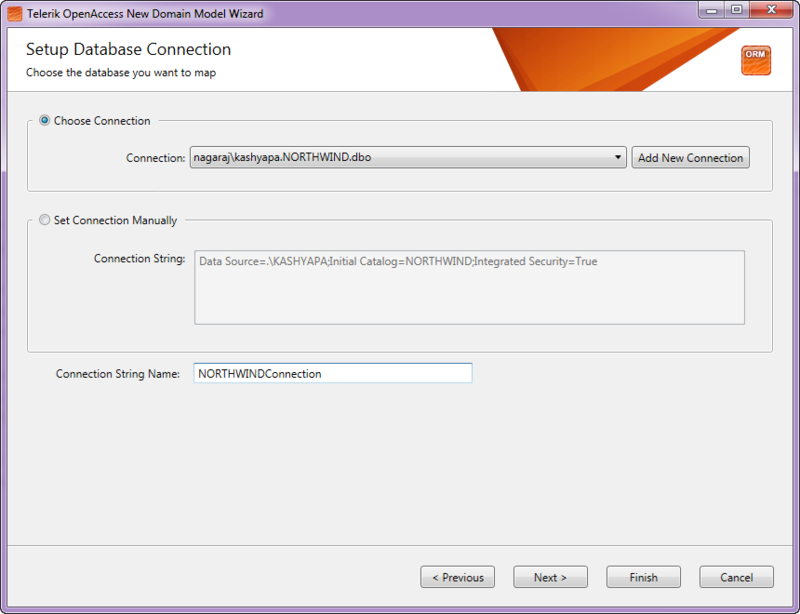 Click the smart tag and open Configuration Wizard. 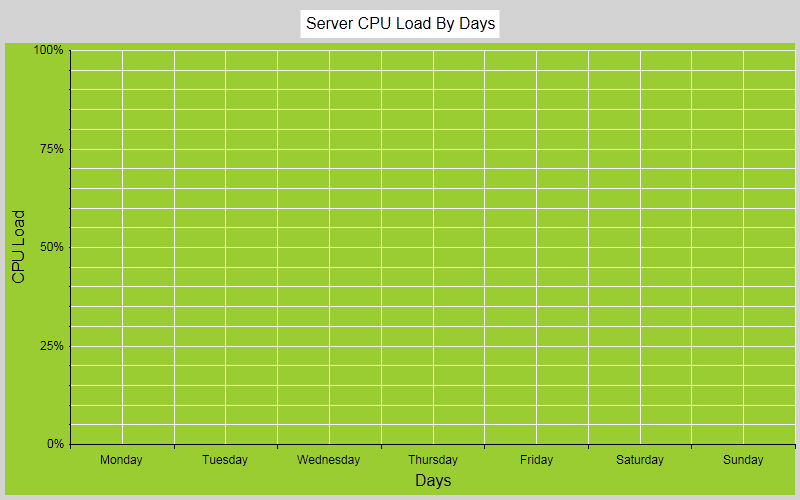 <telerik:RadScheduler ID="sessionCartScheduler" runat="server" AllowEdit="False" AllowInsert="False"
If you have any trouble implementing, please post the difficulties in the comments. 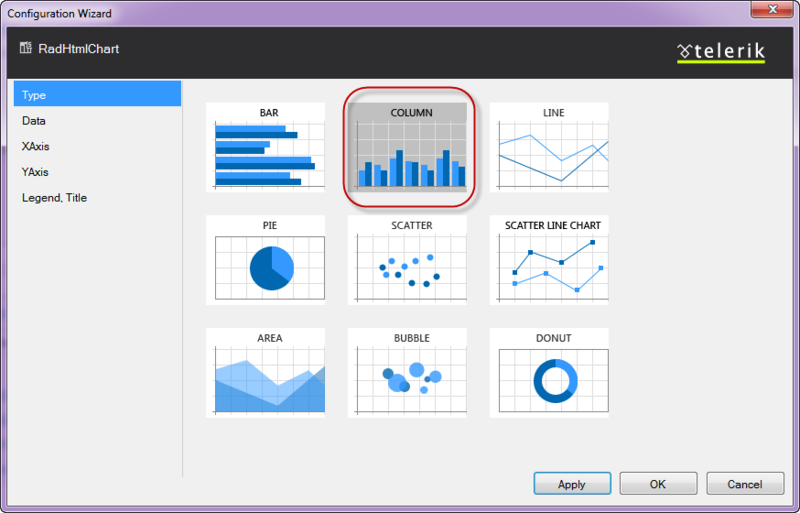 Initially, LINQ data source was used which is now no longer used. The ORM which we have implemented here is Open Access, and syntax to implement CRUD operations are different from that of LINQ. 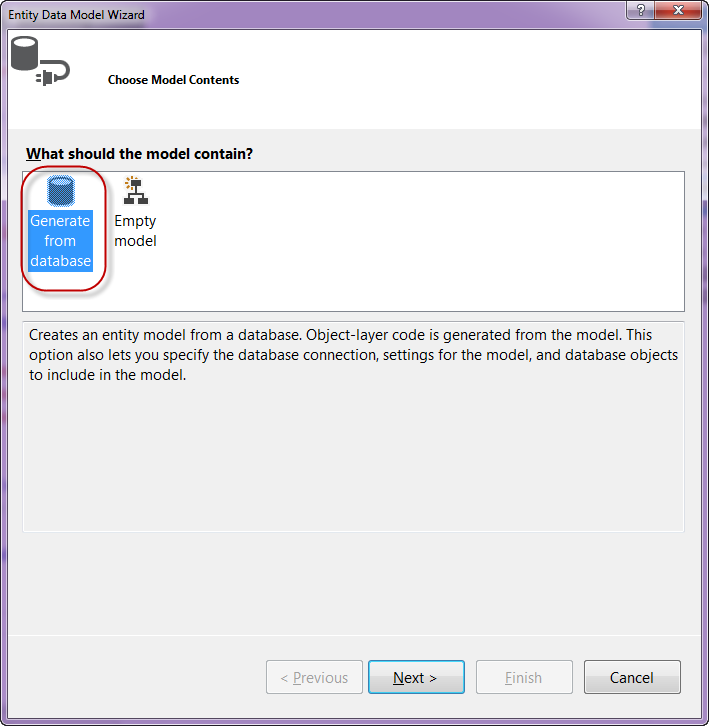 Then it has occurred because we have converted the Linq to SQL to Open Access ORM. 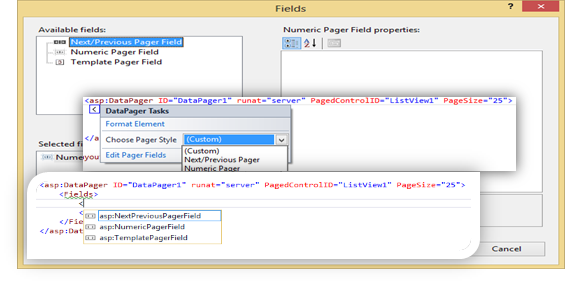 Hence, the control LinqDataSource will not help us map it to the new ORM. 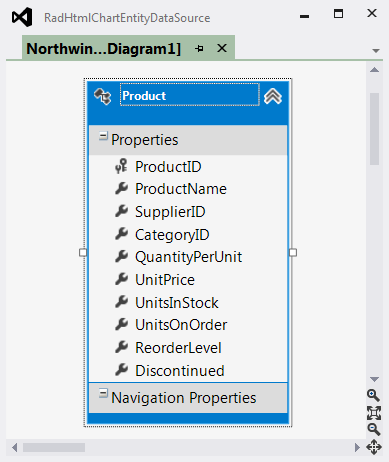 Since we have removed the Linq Data Source so we have to also remove the existing LinqDataSource and create a new DataSource. 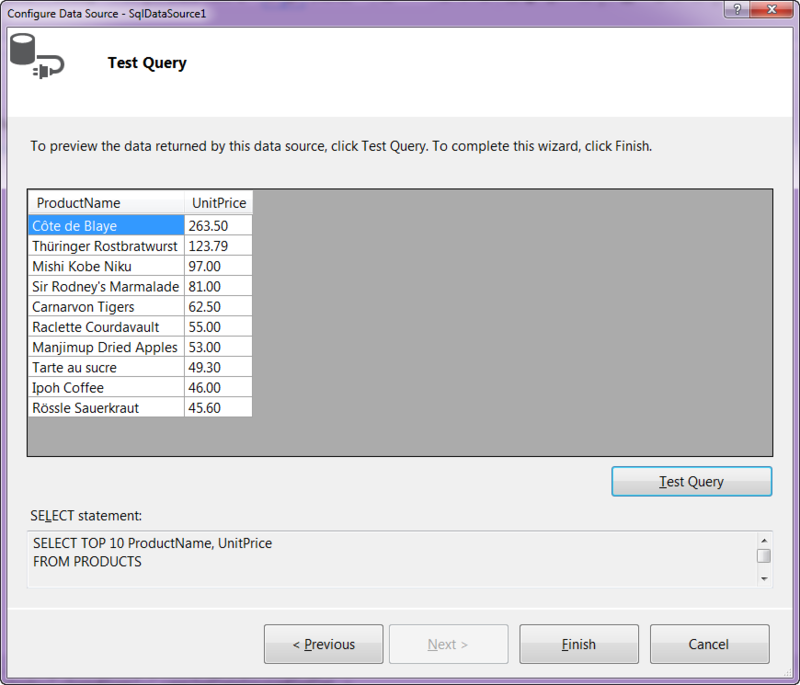 We can use an OpenAccess DataSource control replacing the LINQ DataSource and keep the same ID. Hence, no more effort is needed. 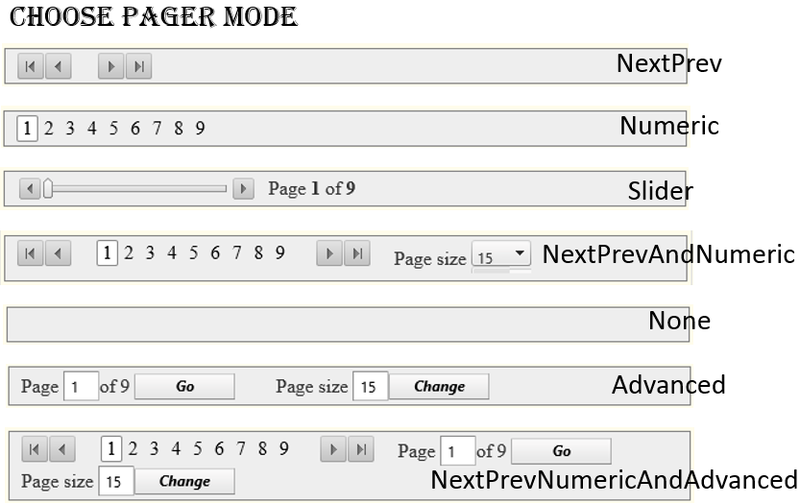 We added the following code under the Page_Load event. 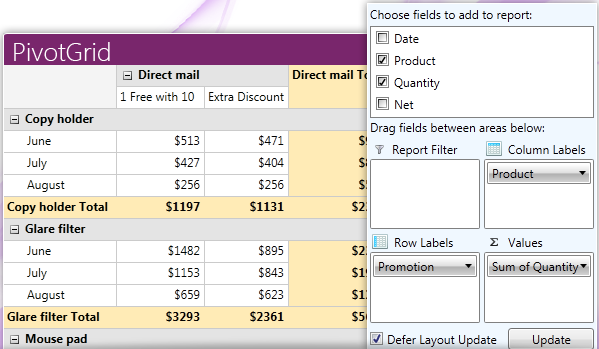 We created a DataTable and then linked the DataSource property of the DropDownList with the newly created DataTables. This helps in insulating the data. 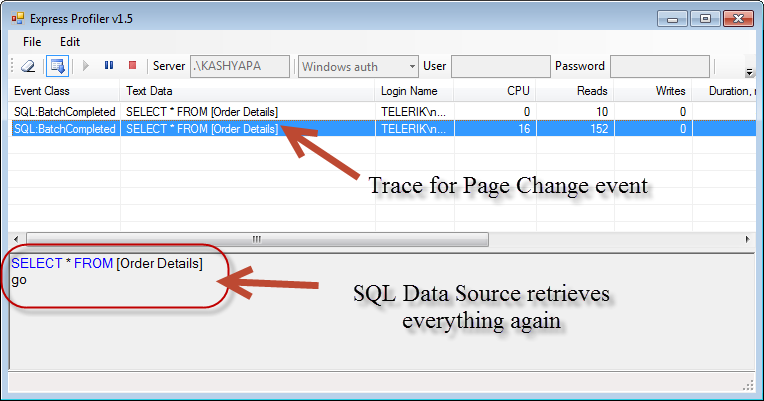 We also need to remove the DataSource property from the controls where we had linked to the Linq DataSource. 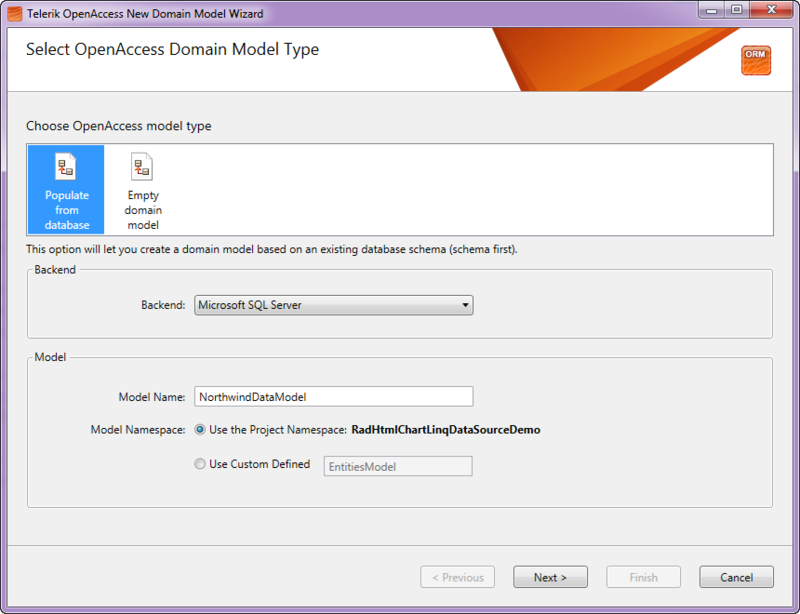 Drag the OpenAccessDataSource tool under the OpenAcces group. You will have something like this in the design view. Here we are asked to save changes to our items. Click Yes. 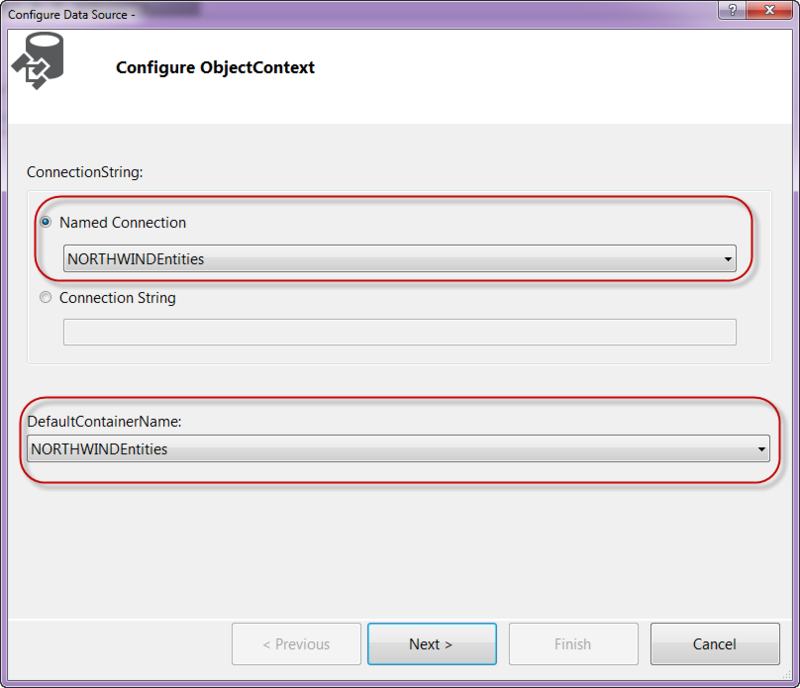 Choose the data context for your application and click next. 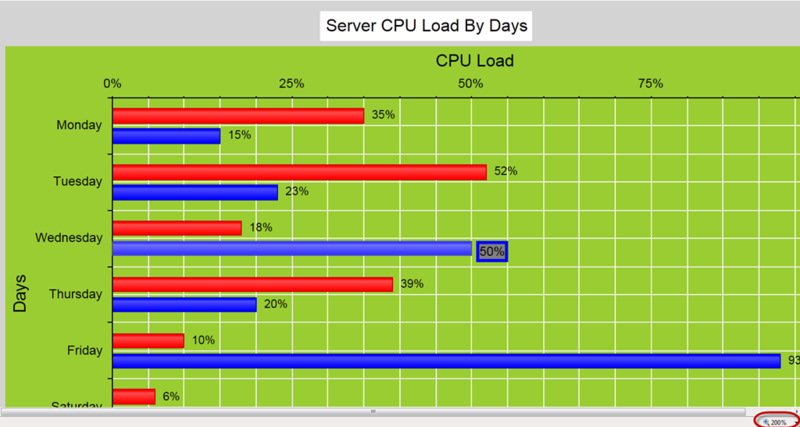 Choose the table you want to retrieve from the database and click finish. We also rename the ID as same as the asp:LinqDataSource so that there is no name-conflict anywhere else in our application. Now your code will look like this. Where “Badge” is our table-name. Note: We have not used OpenAccessDataSource anywhere because it takes direct dependency from the OpenAccess. 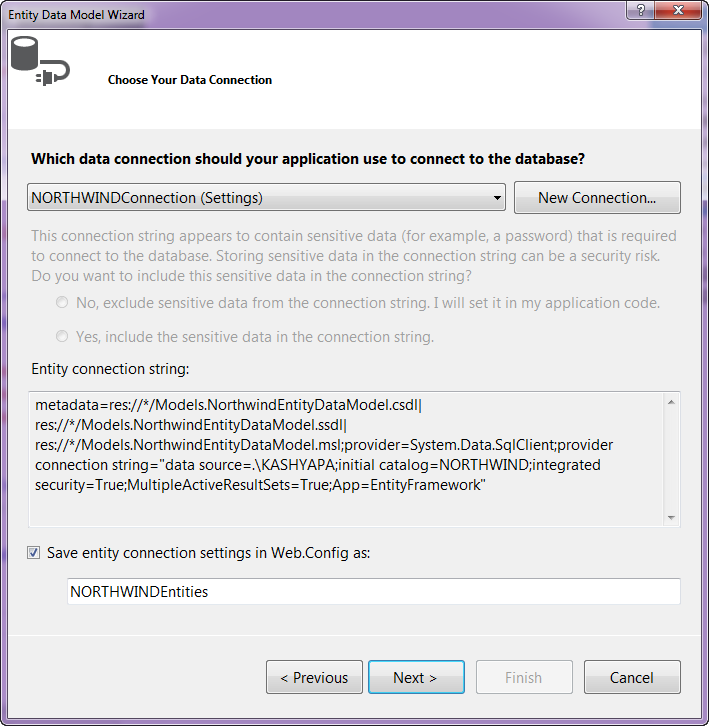 Another Runtime error you may encounter is over the DataBind property. 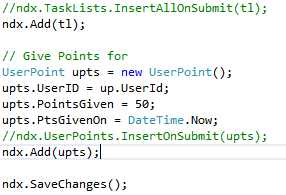 This occurs because LINQ sends the data as a list but now since we are using OpenAccess the data returned is in the form of iEnumerable and hence we need to convert it to a List explicitly. 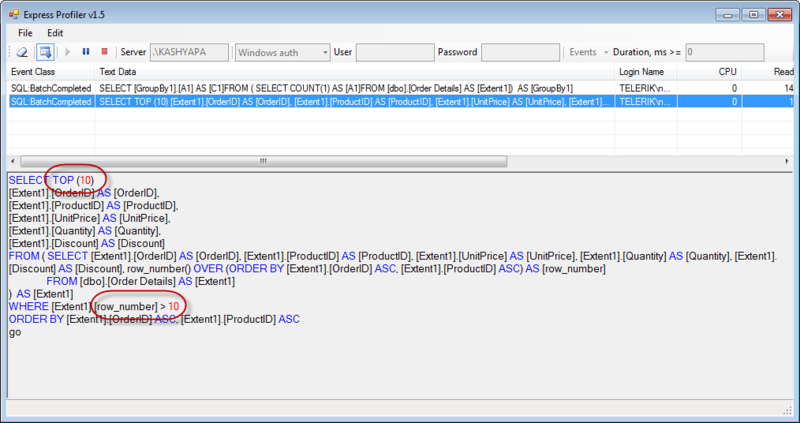 It can be solved by simply adding the ToList() property to the DataSource. 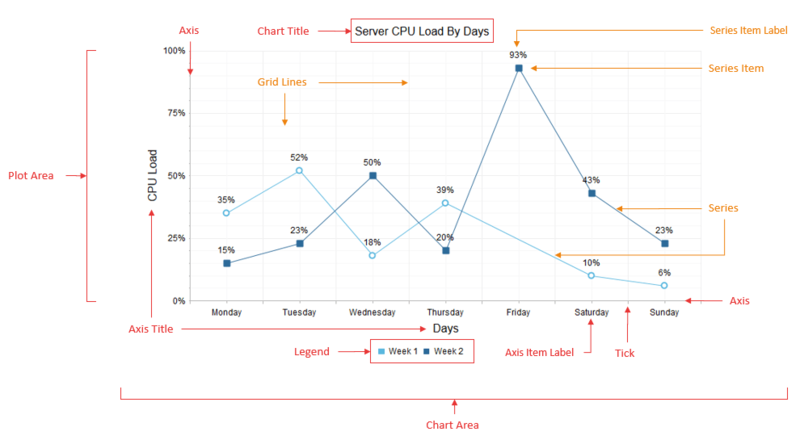 In the blog post, we will take a look at the things which make up the RadHtmlChart pictorially. 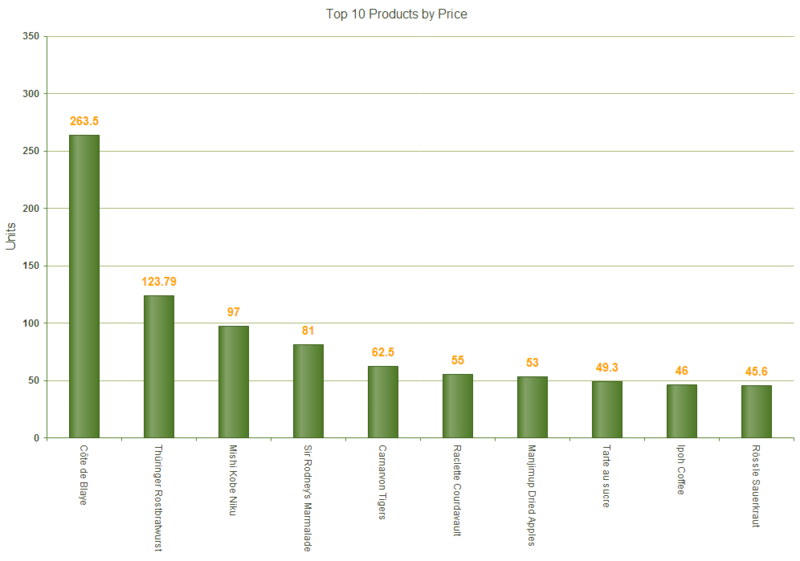 We will look at the different element which make up a chart and how they are placed visually. 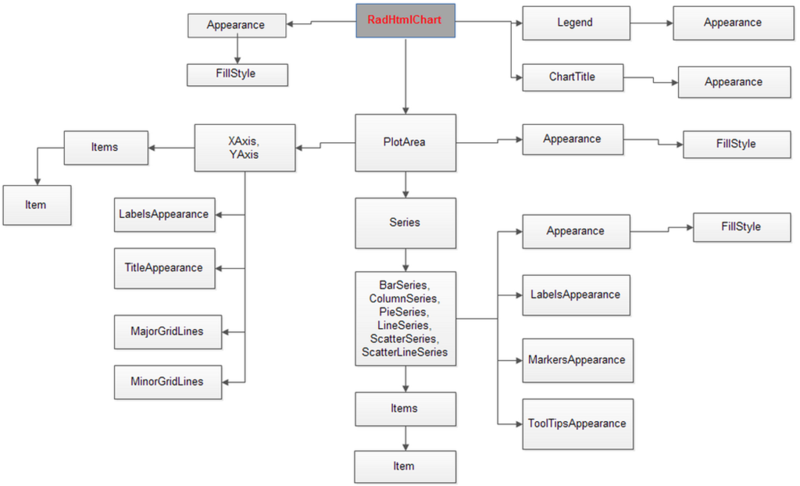 As you can see above, all the elements which make up the RadHtmlChart is laid out and tagged very clearly so that you can make out what element goes where. 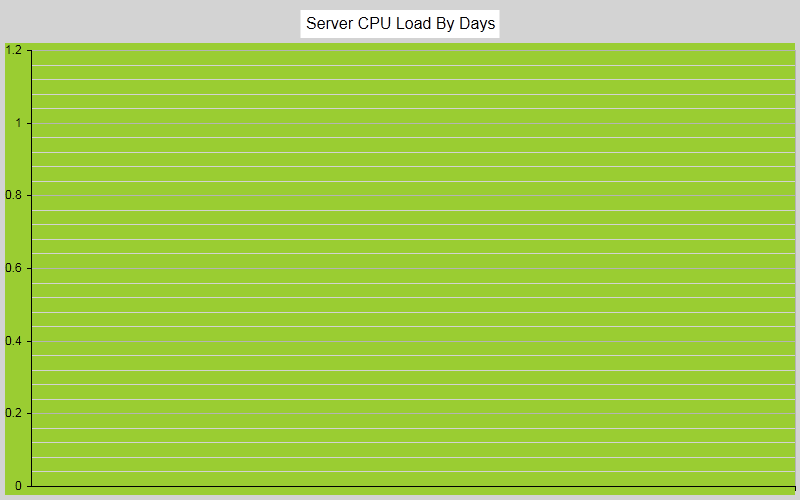 We will see the server side control hierarchy visually in next post.